Tibetan and Nepali community members gathered in Queens last Friday to celebrate the Tibetan Buddhist New Year, known as "Losar." The celebration was hosted by the United Sherpa Association, located at 41-01 75th St. in Jackson Heights. "Everyone's happy. Just like Christmas," said 47-year-old Tsering Chokey. The terrorist attack on Tuesday afternoon, Halloween day in New York City, was not the kind of horror so many New Yorkers woke up to celebrate that morning. The attack, carried out by 29-year-old Sayfullo Saipov, left eight people dead and eleven more injured after he drove a truck through a bike lane in Lower Manhattan for 14 blocks, as reported by the Associated Press. Yet the annual Halloween Parade on 6th Avenue in Greenwich Village was to go on as scheduled. 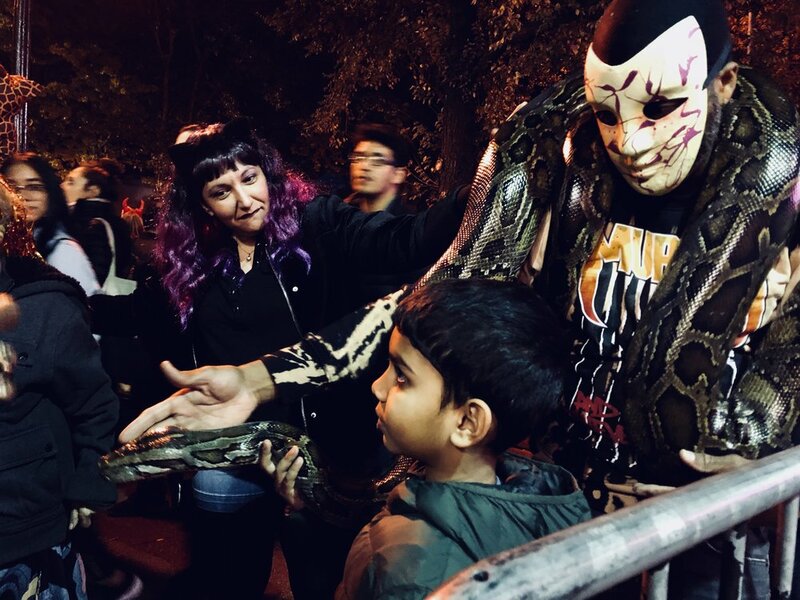 “It’s still Halloween in New York City,” said a police officer stationed at the West 4 subway stop as a horde of ghouls, superheroes and monsters shuffled past him into the corridor leading to the street. Aboveground the parade was in full swing. The vibrant feathers from the performers in the street were barely visible from the back of the crowd, but that didn’t seem to matter to some parade goers because a man, who said to call him Hannibal Morgan, 46, was in the back with a python wrapped around his shoulders. Leaning up against a building near the python was 25-year-old Nay Bourne, dressed as supervillain Harley Quinn. When asked if she reconsidered attending the night’s celebrations, she said she thought, “Should I just go home, and stay home?” Bourne was on the F train to Manhattan when she saw that a Facebook friend had marked herself as ‘safe.’ Her cell signal underground faded, so she said her prayers and did not to investigate the attack any further, at least not this night, she said. “Not knowing makes me feel safe,” she said. The beats of Cardi B’s “Bodak Yellow” interrupted Bourne as a mob of skeletons and tutu adorned teenagers shouted out the chorus in unison, and just as suddenly as the song entered into the flow of people, it disappeared along with the skeleton and tutu mob up the street and into the chaos, where two pandas stood on their tip-toes, trying to catch glimpses of the parade. Standing elsewhere in the crowd wrapped up in a modest khaki coat was Sharon Keller, an artist who moved to New York City just over a year ago. Her short white hair was cut into bangs that framed her bespectacled eyes. She said the attack is a lot to hear and talk about, but it doesn’t make her want to leave the city. “New York is a quartz block, it created this energy,” said Keller. “And crystals have healing powers.” She laughed at this metaphor and turned back to the procession of monsters. Much of our recent history of the human race would remain enigmatic if it weren’t for the creation of the first photographic image in the early 19th century. For the first time in the history of the world, we are able to see photographs of people and world events that have since long passed. Since the invention of the camera obscura, we have not only mastered the photograph, but the camera has now evolved to become an insignificant lens on our smartphones. The accessibility of the camera has led to the world’s population taking an estimated 10 billion photos daily - and millennials are guilty of this offense more than any other generation before them. This leads many of us to question if a millennial would ever care about their family history, especially when it is confined by the fraying edges of antique, colorless photographs. This is the age of Snapchat filters, Instagram ‘likes’ and Facebook after all. However Sally Enfield, a millennial, was just 17-years-old when the sepia washed faces in her old family photos came to life through a spectacular story of tragedy, bravery and triumph. Sally’s grandfather emigrated from Nazi Germany to the U.S. in 1939. Sally said, “When I was [a child], I knew about the Holocaust and that my mother’s family members were survivors - but it always made me sad and I didn’t like to talk about it.” That changed around the time of Sally’s Bat mitzvah, and when she was 17, she received some enlightening information about her family’s story from Rabbi Frank Dabba Smith. This new information led her to Germany in 2011 to meet the grandson of Ernst Leitz, the man who provided a safe escape for her grandfather, his parents and his brother to America. Due to Ernst Leitz’s bravery, Sally’s family and many other Jewish families escaped a vicious genocide that has left a deep scar on humanity. Sally said, “When ten lives are lost, generations later can number hundreds, maybe thousands [of lives] that never came to be.” Without Leitz’s letter of recommendation, members of her family would have remained in Buchenwald concentration camp, unlikely to survive and void of the very U.S. visa that saved their lives. In addition to securing visas for her family, Leitz also secured a thriving business for her great-grandfather to manage once they safely crossed the Atlantic. Sally recognizes that her life might have been an example of lost life had her family never met Ernst Leitz more than 77 years ago. In Germany, Sally finally pieced her family’s story of persecution and freedom together. In the process she also uncovered a ray of light. “The world can be a frightening place, but during one of the darkest moments in our history, there were people like Ernst Leitz and others who stepped forward to help many individuals who might have become victims,” she says. Through Rabbi Frank Dabba Smith and Sally Enfield’s discoveries, this story can now be passed down to the younger generations of the Enfield family. It will serve as a reminder, to them and to all of us, of the endless compassion that humanity can offer even during terrible tragedy and injustice. For Sally, the only way she could cope with the emotionally dense visit was to document it through the lens of her own camera. Every click of her shutter soothed the pain that had been awakened by the return of an Enfield family member to German soil. Five years after returning from Germany Sally contributes to the 10 billion photos taken every day to share a triumphant story of the past. Perhaps we could adopt the millennial’s obsessive practice of photo snapping, and social media sharing – because is it not these very photos and stories, past or present, that connect us all? I was pretty positive I had gone completely mad as I stood on the curb outside the train station in Lisieux, France. I was waiting for my ride to an unknown destination from a mystery host in the countryside. All I knew about my host was that her name was Deb, she was British and she was looking for help with house maintenance. We had corresponded on the website, “Workaway,” only briefly to confirm my stay with her and exchange my train arrival and her license plate number. I glanced at the time anxiously and looked around once more at the crowd that was slowly dwindling away. The sun had set, and I watched my fellow passengers from the Paris > Lisieux train hug loved ones and clamber into the back seats of cars with awkward luggage. I was getting ever more alone by the minute, my ball cap and sandals clearly marking me as a vulnerable foreigner alone at a dark train station in the middle of suburban France. I thought that if anything, I could turnaround and get back on a train to Paris and book somewhere to sleep once I got Wi-Fi. I thought that if things really turned for the worse, I could stay on that train all the way to the airport and just buy my ticket home from there straight away. I could go back to work and find a cute apartment in the Avenues suburb of Salt Lake City. I could paint my kitchen table yellow. I could buy a puppy and spend the rest of my days safely confined within the state of Utah. These thoughts raced through my head in the six minutes I stood on that curb, while also allowing the horror stories about stranger danger and cat phishing to infiltrate my mind. Just as I was asking someone to use a phone, a little Hyundai Coupe with the matching license plate number to the one I had scrawled on the back of my hand pulled into the parking lot. I began walking towards the car as a woman got out of the right side driver’s seat, a British car! Deb. She embraced me in a hug, helped lug my suitcase into the trunk of the car and offered me a sweet green apple. We chatted as she drove me to her home, a cottage built in 1756, still standing just outside a town that was nearly decimated during World War II. She served me a bowl of Moroccan soup and throughout the next two weeks we shared many meals together in the company of several others that also decided to trust the goodness of the Internet. We joined forces from all walks of life to complete the work that Deb required in exchange for hot meals and warm beds to sleep in and enriching conversations about the world. Sebastian Booth came from England. He is a skilled musician with a love for jazz and intellectual reads about feminism among other varied topics. He is a deep thinker whose questions always sparked my curiosity, and silenced many of us as we digested his questions and pondered. “Do you think sharks would be embarrassed if they knew we could see their fins above the water?” “Do you ever think about the horrors of drifting?” I wish I could remember more of the questions. Sebastian- you are an exquisite thinker. 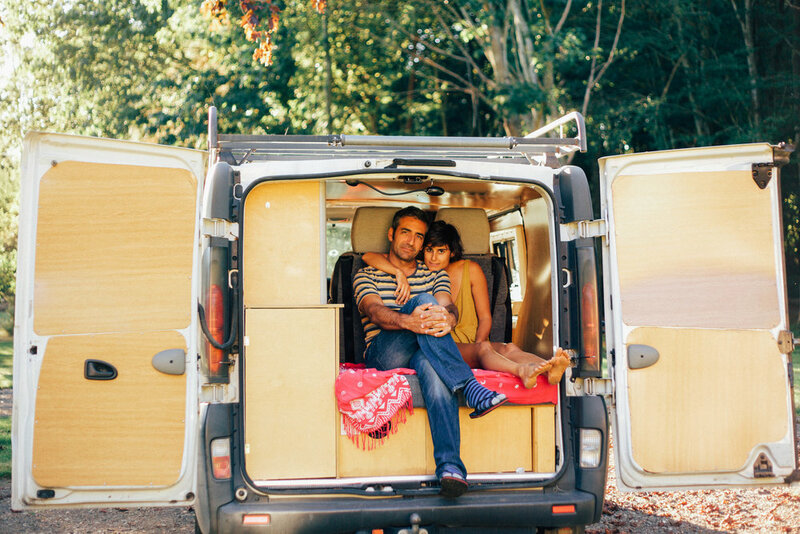 Laia and Ramon had traveled from their hometown in Valencia, Spain in a van that had been converted into a living space- complete with a bed and kitchen. They are free spirited, kind humans who offered Sebastian and I a spot in their van to places like the D-day Beaches and Mont St. Michel on our days off. They said that many of their family and friends back home had urged them to go the traditional route and get married after being together for so many years. Start a family. Buy a house. Instead they quit their jobs and booked themselves a one-way ticket to South Africa. They should be in South Africa by now, and I wish them the best of luck as they continue to inspire others to color outside the lines. All of us had quit our formal jobs and all of us bonded over books and coffee breaks along with Deb. We painted walls, measured new carpet, installed baseboards and uprooted weeds together. It was hard work and yet rewarding when we put a room back together or did a final rake over fresh soil. The end of a workday brought wine, or a gin and tonic and a home cooked meal. Our host, Deb, seemed to be unafraid when it came to life and love. She voiced her opinion brazenly without offense and was not sorry for speaking her mind. I loved that. She went to the beach one Sunday by herself to swim in the sea and spends time painting whimsical pieces, which now hang in every room of the house. I was in awe when it was discovered that she was the artist of the yellow elephants in the dining room, which I had been admiring since my arrival. The colors and brushstrokes swept across each canvas in a demonstration of passion for the art. She appreciates every unique character that graces her life path. Deb is a beautiful soul, and I was more astounded every day by her ideas about the world. I never thought that the Internet would lead these five wanderers to each other and I am so happy that it did. I am mostly happy that none of us were secretly cat phishing the other. I am especially happy that we all took a risk and because of that, we were able to create connections with each other and learn more about ourselves in the process. Bon voyage to each and every one of you on your future travels!